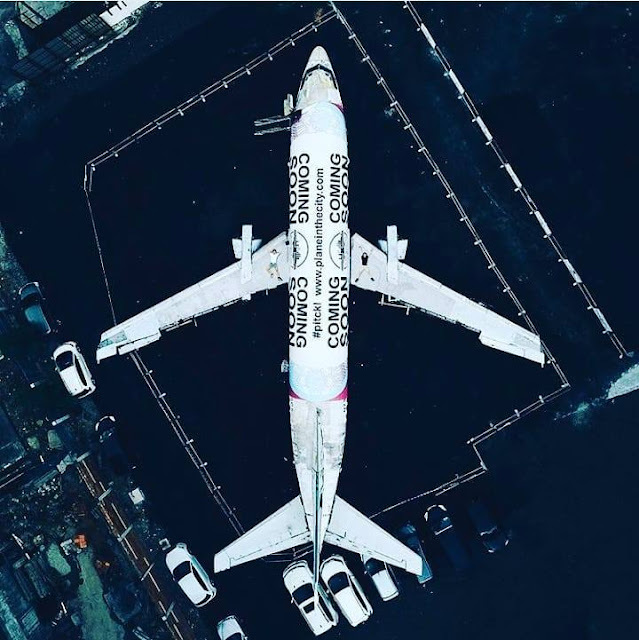 Have you heard of Carousell? For those of you who love shopping for pre-loved items or maybe have been selling your pre-loved items, you may have already heard of this awesome platform. 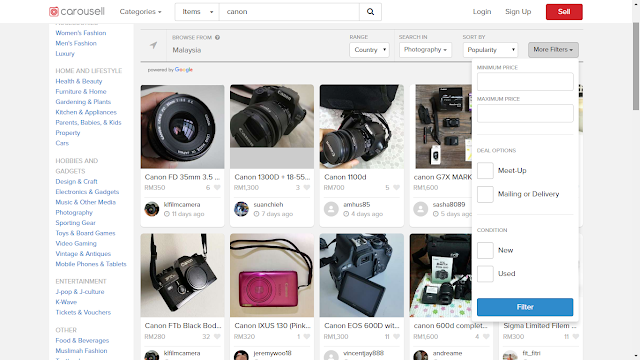 Carousell has been in the market for quite some time and have grown to be a great platform for those who love online shopping or for those who like myself have too many stuff at home and looking for a place to sell them. 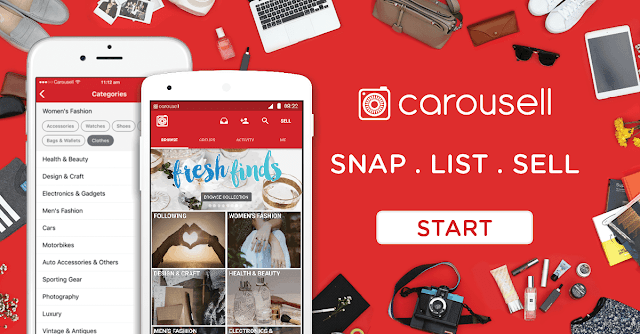 Carousell is available on both Desktop and also through their App. 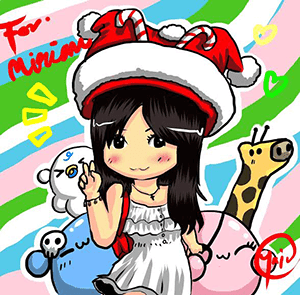 For myself, I prefer using the app because it is so easy to use. 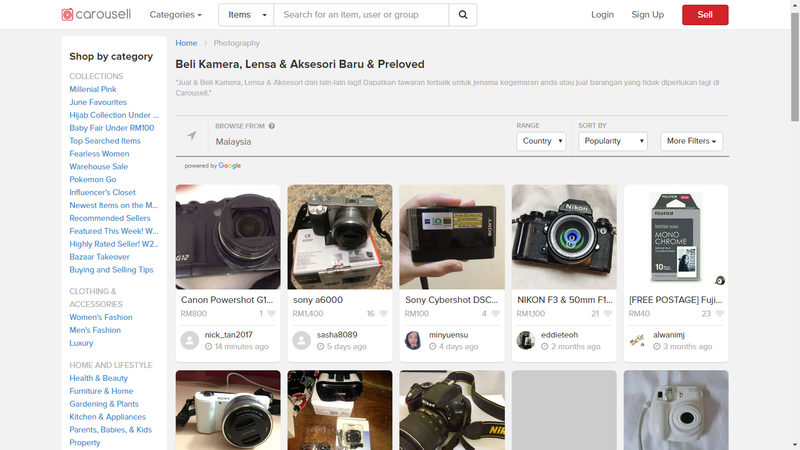 If I want to sell my items, all I've got to do is to Snap, Upload and Sell! It's just that simple. Ever since I started blogging, I have been constantly upgrading my gadgets to improve on my photo quality so that I can capture better moments when I travel or also my food shots. From a simple digital camera, to my Sony A5000 and now my baby Fujifilm XT-10 the world of photography has really intrigued me. Well my baby Sony A5000 has been passed down to my sister when she was studying abroad and unfortunately the lens is damaged so for the time being, it is put to rest while I find a replacement. Although I love my Fujifilm XT-10, it is rather heavy especially with my 18-55mm lens plus it doesn't flip 180 degrees so selfies and wefies are an issue which is why I have been thinking of looking for a camera that can suit my travel needs. 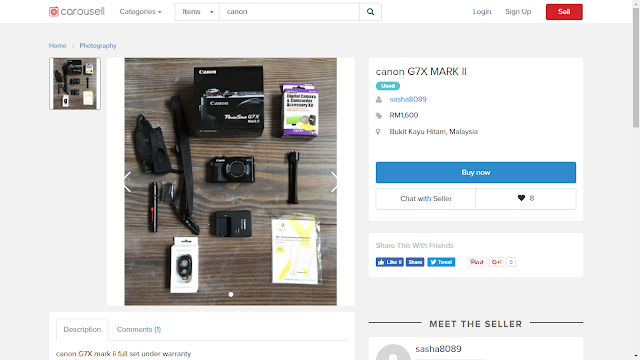 Getting a new camera which suits my needs plus doesn't break the bank can be an issue which is why I decided to head over on Carousell to check if there are any second hand cameras which are in good condition that I can consider. Since I've got a Sony and a Fujifilm, I thought I would give Canon Cameras a chance. Navigating through the Carousell app was a breeze. You can check out the mini video of how I browse through looking for my dream camera. 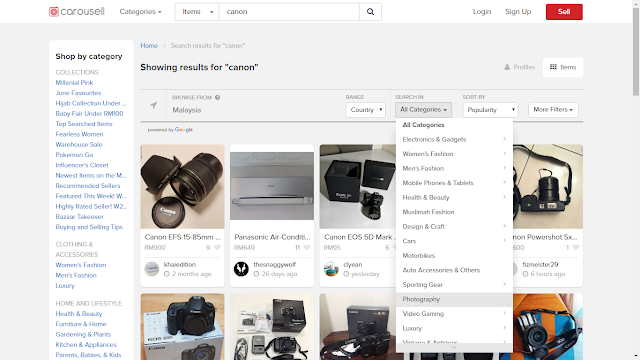 I've heard from friends that Canon has quite a good variety of compact cameras so that was the first keyword I searched for. Can't believe there are such a wide variety of options to choose from and there are not only compact cameras but also some DSLR on sale. There are several similar cameras up on sale so you can also key in the exact camera model you are looking for and compare the prices. Prices on Carousel are always much cheaper than at the retail outlet. How I do it is I normally filter my options according to the lowest price to the highest price. 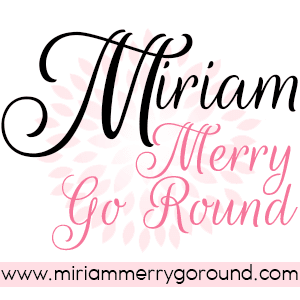 This way I can check out the items that are the cheapest. Some of you may think that for sure the prices on Carousell are cheaper if they are pre-loved but if you search properly, you will see that there are some retail outlets which uses Carousell to promote their items so it's all brand new. You can actually get a cheaper price from Carousell and head on to their shop to get your items. 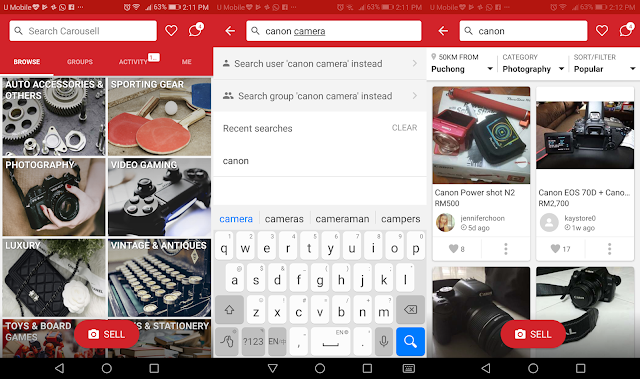 Carousell is easily accessible on both Desktop and mobile phones (both Android and iOs) and it is super easy to navigate. The different categories are listed on their home page and you just need to select which category you are interested in. Like for myself, since I'm looking for cameras I just have to select the Photography category. Then you can filter according to the location, price, ratings etc. 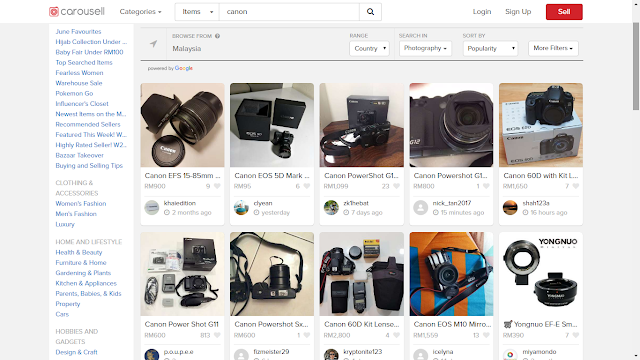 I know many of us are skeptical about online purchases especially for preloved items but on Carousell it's actually very safe as you are able to see the ratings of the seller and also the condition of the items you are purchasing. You can also always opt for Cash-on-Delivery option so that you can have a look at your items before purchasing it. Not only that, you can also compare each seller and their items before making your decision plus the app has a messenger function where you can chat with the seller about the items if you are interested. If you find the seller dodgy, well you can just not purchase it from him/her. At the end of the day, Carousell is all about supporting your fellow community; those who are selling and buying pre-loved items. In the whole process, we are supporting each other in terms of buying and selling our stuff. You never know you might even make some new friends along the way. By the way, do you know how to hack someones phone without them knowing?